Several relevant Studies, Reports and Books drafted by our Team in the field of Negotiation, Mediation and ADR, represent key milestone publications in the sector. Ten years since its adoption, the EU Mediation Directive remains very far from reaching its stated goals of encouraging the use of mediation and especially achieving a “balanced relationship between mediation and judicial proceedings” (Article 1). 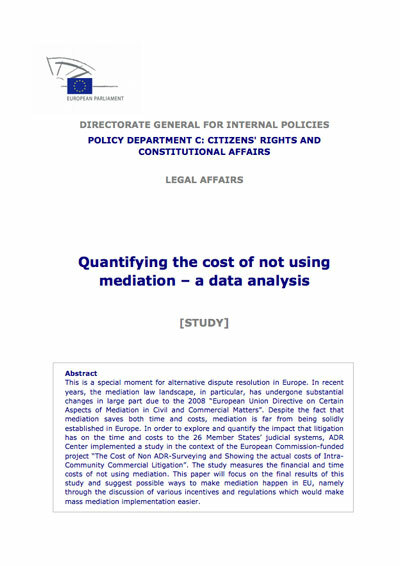 The paradox of mediation – universally praised and promoted, but still used in less than 1 percent of the cases in civil and commercial litigation in the EU – grows disturbingly bigger as official data and multiple studies have clearly shown that the best way, if not the only one, to increase significantly the number of mediated disputes is to require that litigants make a serious and reasonable initial effort at mediation. This tool – adopted at the 31st plenary meeting of the CEPEJ, Strasbourg, 3-4 December 2018 – sets out a number of principles to which mediation centers, institutes or other mediation providers may voluntarily decide to commit themselves. It may be used by mediation providers (including all their employees and affiliated persons) that offer mediation services in different fields of disputes such as civil, commercial, family, administrative and penal matters. 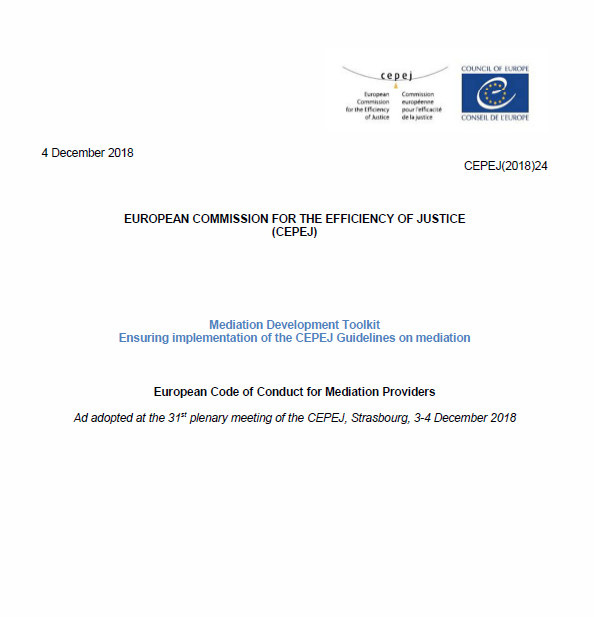 This code is coherent and may be used in conjuction with the European Code of Conduct for Mediators developed in 2004 under the auspices of the European Union, and with the Council of Europe and the European Commission for the Efficiency of Justice (CEPEJ) reccommendations, guidelines and other instruments on mediation and ADR. ADR assistance projects are often being built around a model of delivering pre-existing and pre-built training courses to various audiences, with the result that local professionals are trained as mediators out of the local context. This approach may develop capacity to mediate, but does not effectively create a dynamic and sustainable mediation system. ADR Center’s much broader scope of business has allowed to develop a much more comprehensive and effective approach to ADR development. Both daily experience in the administration of mediation and 20 years of international experience in ADR capacity building assistance, have developed the comprehensive proven system “ADR Center Two Track Methodology”. 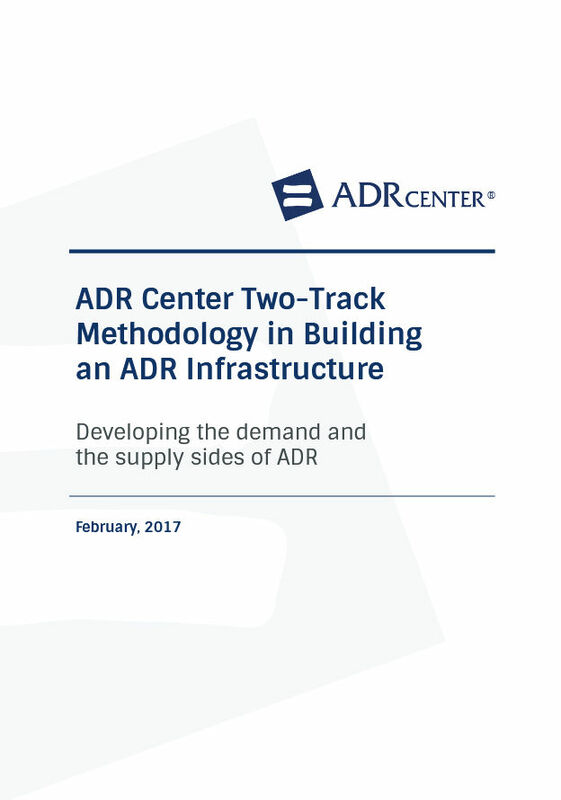 More than 50 activities and deliverables make up the two tracks which represent the demand and the supply side of ADR. The publication was written by Leonardo D’Urso, Constantin-Adi Gavrila and Romina Canessa. 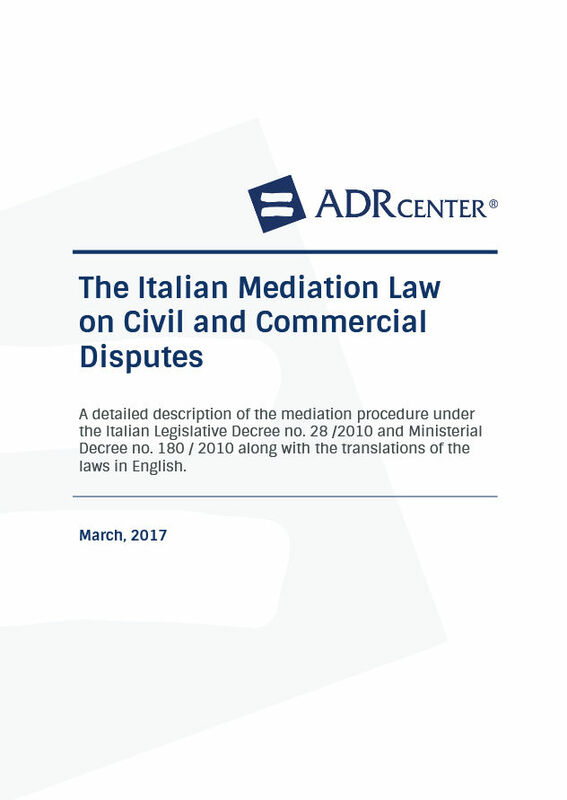 A detailed description of the mediation procedure under the Italian Legislative Decree no. 28/2010 and Ministerial Decree no. 180/2010 along with the translations of the laws in English by ADR Center. 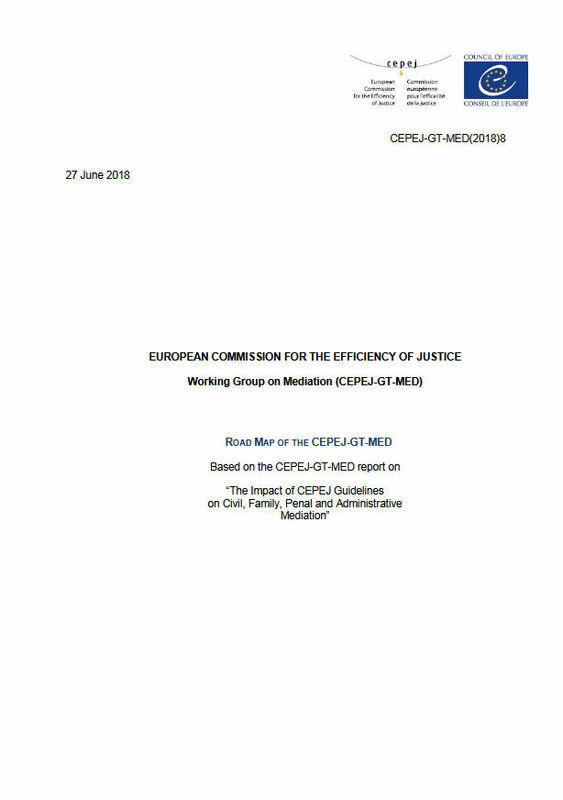 Following its reactivation in 2017, the CEPEJ working group on mediation (CEPEJ-GT-MED) assessed the concrete impact within the 47 Member States of the CEPEJ Guidelines it had developed in 2007 regarding : penal mediation (CEPEJ(2007)13), family and civil mediation (CEPEJ(2007)14) and alternatives to litigation between administrative authorities and private parties (CEPEJ(2007)15). In order to achieve this goal, a questionnaire composed of 31 questions divided into four main sections corresponding to the four types of mediation (civil, family, penal and administrative) was developed by Leonardo D’Urso, CEPEJ-GT-MED scientific expert. The questionnaire was validated by the members of CEPEJ-GT-MED and sent to all 47 CEPEJ national correspondents in July 2017. All individual replies were recorded in an online platform managed by the Secretariat. disputes settled by mediation and disputes adjudicated in judicial proceedings in all four civil, family, penal and administrative matters. ADR Center’s CEO, Mr. Leonardo D’Urso, is scientific expert of CEPEJ-GT-MED. At its 30th plenary meeting, the CEPEJ completed the list of existing Council of Europe instruments in the field of mediation, in particular the Council of Europe Recommendations (Recommendation (98) 1 on family mediation; Recommendation (99) 19 concerning mediation in criminal matters ; Recommendation (2001) 9 on alternatives to litigation between administrative authorities and private parties and Recommendation (2002) 10 on mediation in civil matters) and the CEPEJ Guidelines on civil, family, penal and administrative mediation by adopting a series of concrete tools to help member states to develop the use of mediation, as well as to support mediation actors in their daily practice. The Mediation development toolkit is intended to evolve and adapt to different national contexts and will be gradually completed with new tools. ADR Center’s CEO, Mr. Leonardo D’Urso, as scientific expert of CEPEJ-GT-MED has contributed to the draft of this Toolkit. 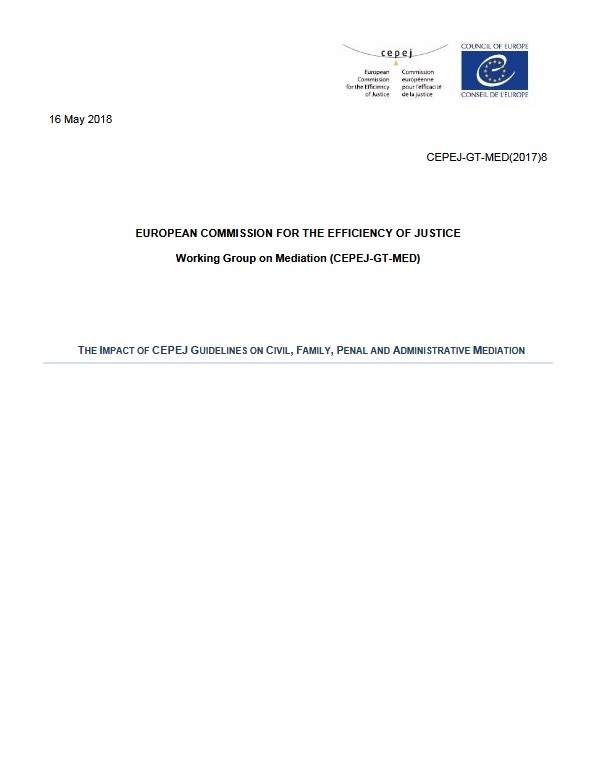 47 Member States of Council of Europe of the existing CEPEJ Guidelines on: penal mediation (CEPEJ(2007)13); family and civil mediation (CEPEJ(2007)14); alternatives to litigation between administrative authorities and private parties (CEPEJ(2007)15). The Guidelines issued recommendations concerning the availability of mediation services includingspecific measures that should be taken to promote and set up workable mediation schemes such asmediator qualification, codes of conduct and the roles of the various parties. The Guidelines alsocovered the accessibility of the different mediation schemes, their impact on limitations of terms,sanctions, and cost. In addition, recommendations for increasing awareness of mediation by thegeneral public, judiciary, and lawyers among others is also included. With all due respect to the opinions andtheories on the right approach to substantiallyincreasing the number of mediations in a jurisdictionafter many years of trial and errors, it istime to analyze objectively the verified resultsof different approaches in order to evaluatewhat worked and what failed. The Italian statistics from the past fouryears give a clear illustration of drastically different results from three different typesof recourse to mediation currently in place. The contrasting results occur within the samejurisdiction—with the same citizens, lawyers, judges—and prove the number of mediationsis not dependent on the “culture” or qualityof mediators, but the most effective legislative mediation in place.Statistics show that currently, The Typemodel titled “Recourse by Voluntary Agreementduring a Required Initial Mediation Session” is the only effective model that can generateenough mediations in a period of two or threeyears for an entire jurisdiction. The 2008 EU Directive on Mediation has been a key milestone for all Member States in introducing various national legislation on mediation in civil and commercial matters. However, the goals stated in Article 1 of the Directive, towards encouraging the use of mediation and especially achieving a “balanced relationship between mediation and judicial proceedings” have clearly not been realized. This paper, commissioned by the European Parliament’s Policy Department for Citizens’ Rights and Constitutional Affairs upon request by the JURI Committee, examines this issue in detail. Despite the lack of homogeneous statistics, in almost all of the Member States mediation is used in less than 1% of the cases in court: for 1 mediation, 100 cases go to court. 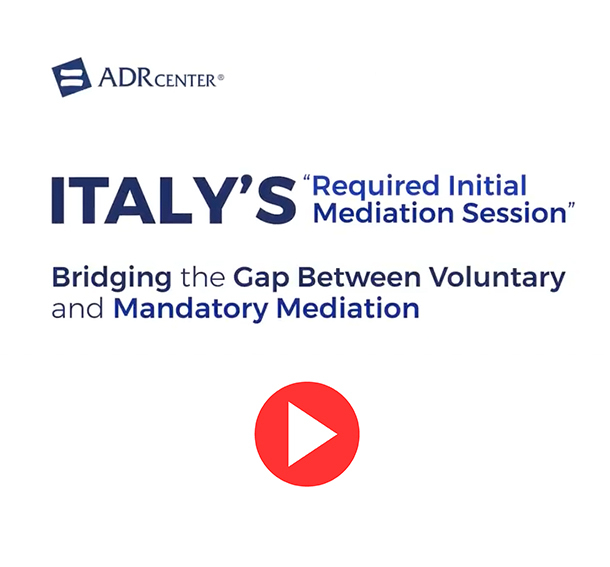 The only exception is the result of the Required Initial Mediation Session model currently used in Italy in a small portion of civil cases which is emerging as a best practice. 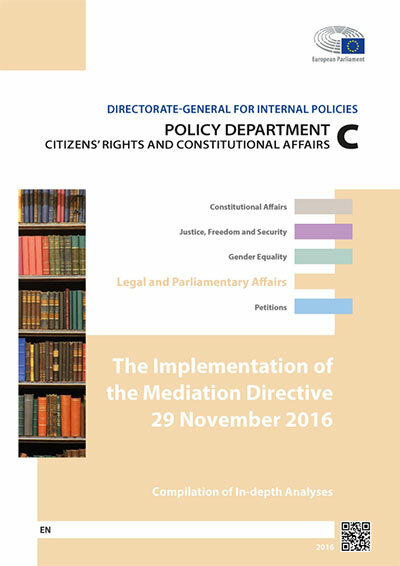 The EU legislator should consider revising Article 5.2 of the Directive, requiring parties, in certain disputes, to participate at least in an initial mediation session with a trained mediator. This mediation attempt should be fast and inexpensive. As an alternative, the EU should require the Member States to use the current version of Article 5.2 to a fuller extent, taking into consideration the type of dispute. 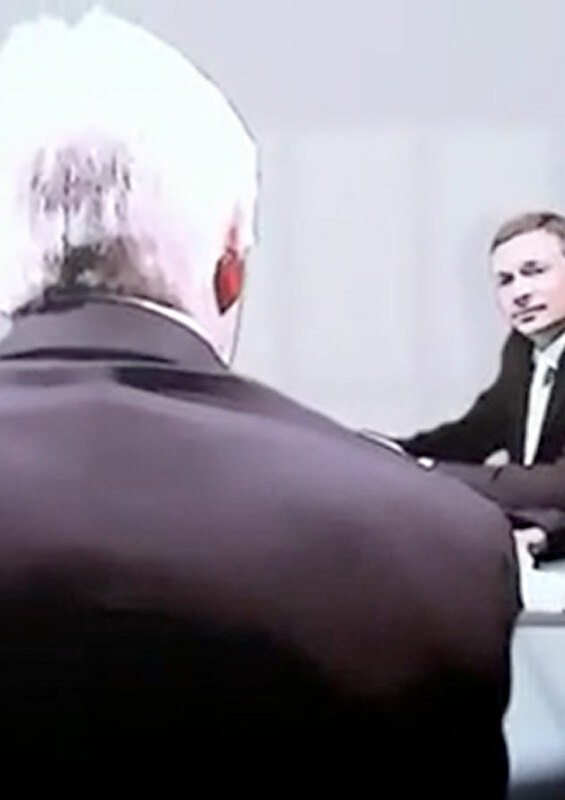 Mediation as a form of Alternative Dispute Resolution (the functioning of Directive 2008/52/EC on certain aspects of mediation in civil and commercial matters offers substantial quantifiable and non-quantifiable benefits. The EU has played a valuable role promoting it among Member States, particularly through the Mediation Directive (2008/52/EC). 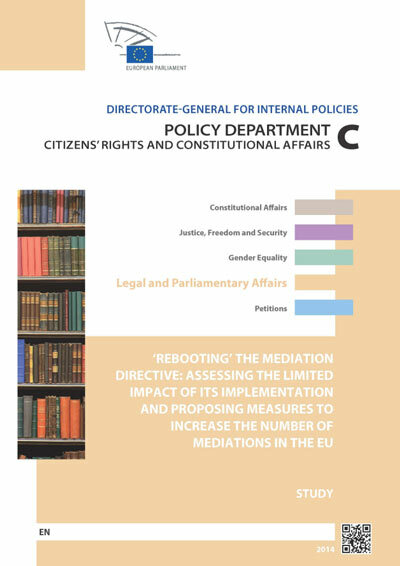 Rebooting the mediation directive: assessing the limited impact of its implementation and proposing measures to increase the number of mediations in the EU. 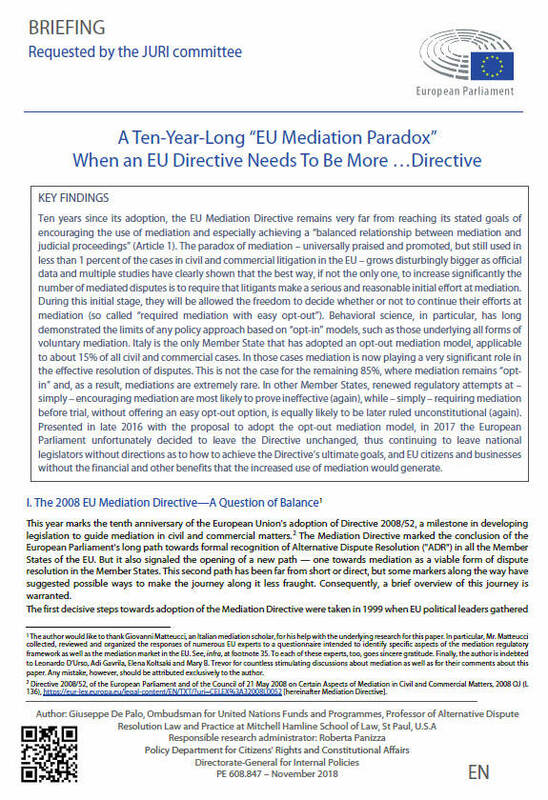 Five and a half years since its adoption, the Mediation Directive (2008/52/EC) has not yet solved the ‘EU Mediation Paradox’. Despite its proven and multiple benefits, mediation in civil and commercial matters is still used in less than 1% of the cases in the EU. 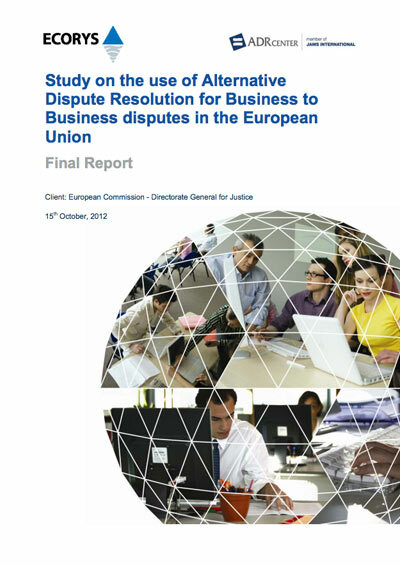 This study, which solicited the views of up to 816 experts from all over Europe, clearly shows that this disappointing performance results from weak pro-mediation. Policies, whether legislative or promotional, in almost all of the 28 Member States. The experts strongly supported a number of proposed non-legislative measures that could promote mediation development. But more fundamentally, the majority view of these experts suggests that introducing a ‘mitigated’ form of mandatory mediation may be the only way to make mediation eventually happens in the EU. The study therefore proposes two ways to “reboot” the Mediation Directive: amend it, or, based on the current wording of its Article 1, request that each Member State commit to, and reach, a simple “balanced relationship target number” between civil litigation and mediation. In the EU there was an absence of uniformity in legislation across the Member States, particularly when it came to mediation. The different individual frameworks failed to fully address the increasing levels of cross-border Business to Business (B2B) disputes. 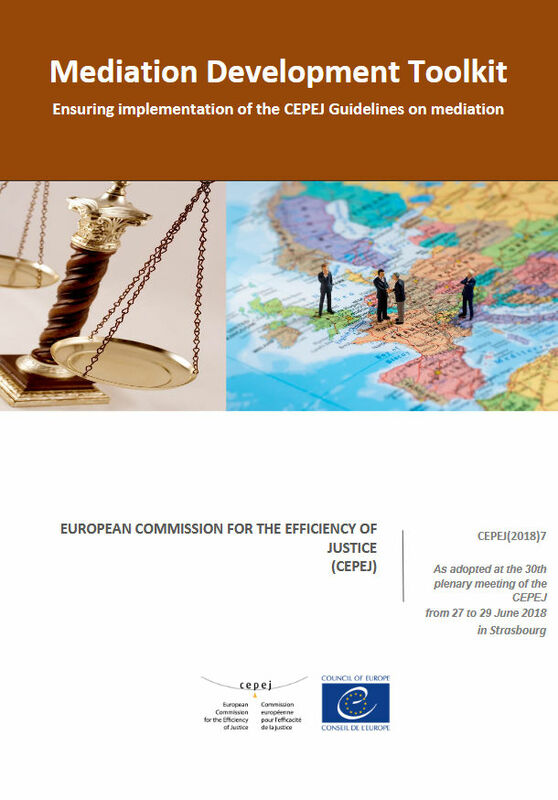 At the request of the European Commission Directorate General for Justice, a study was carried out by ADR Center jointly with Ecorys , as part of the preparation of possible new initiatives dealing with ADR in B2B disputes, complementing the instrument on ADR for B2C disputes, and complementing the Mediation Directive and the Brussels I Regulation. Despite the passage of the Mediation Directive in 2008, in many jurisdictions, lawyers, jurists and litigants were not yet familiar with mediation, making it difficult for advocates to counsel clients or for parties to make informed decisions on their dispute resolution options. This project aimed at contributing to the overall objective of increasing the use of mediation in resolving cross-border commercial and civil disputes. It did so by assisting courts in implementing Article 5 of the Directive on mediation in civil and commercial matters, which deals with information sessions about mediations being “held and easily available” to parties and advocates. The specific objective of the project was to create a specialized, multi-language video about cross-border mediation, allowing the persons responsible for providing mediation information sessions to easily make these sessions available. 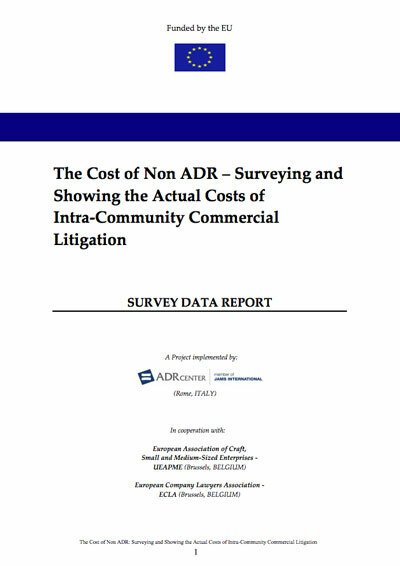 In order to explore and quantify the impact that litigation has on the time and costs to the 26 Member States’ judicial systems, ADR Center implemented a study in the context of the European Commission-funded project “The Cost of Non ADR-Surveying and Showing the actual costs of Intra-Community Commercial Litigation”. The study measures the financial and time costs of not using mediation. 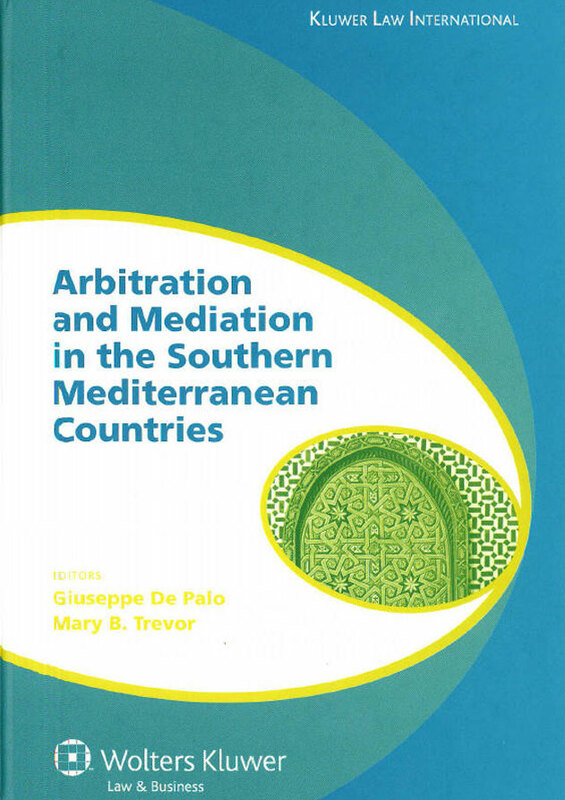 In this highly informative and very useful book, thirty-three local experts describe the ongoing process of adopting and adapting modern techniques of dispute resolution for economic and commercial matters in Algeria, Egypt, Israel, Jordan, Lebanon, Morocco, Syria, Tunisia, Turkey, and the West Bank and Gaza Strip. In October 2009, more than 50 of the world’s leading negotiation scholars gathered in Istanbul, Turkey for the second in a series of three international conferences designed to critically examine what is taught in contemporary negotiation courses and how we teach them, with special emphasis on how best to “translate” teaching methodology to succeed with diverse, global audiences. In organizing the Istanbul conference, we took particular note of a consistent strain of criticism of the artificiality of a classroom environment, which became a running theme of many of our authors in the project’s first year, captured in the previously published RETHINKING NEGOTIATION TEACHING: INNOVATIONS FOR CONTEXT AND CULTURE (DRI Press 2009). It would be hard to imagine a better environment for trying something new and different outside the classroom environment than Istanbul, and we tried to do honor to one of the world’s greatest trading cities in our design for the conference. In brief, we dispatched small teams of scholars into the city’s famous bazaars, for one exercise in studying how negotiation might be taught more actively, and dispatched teams into the city’s less touristy neighborhoods on another occasion, with instructions that required each team to negotiate internally. 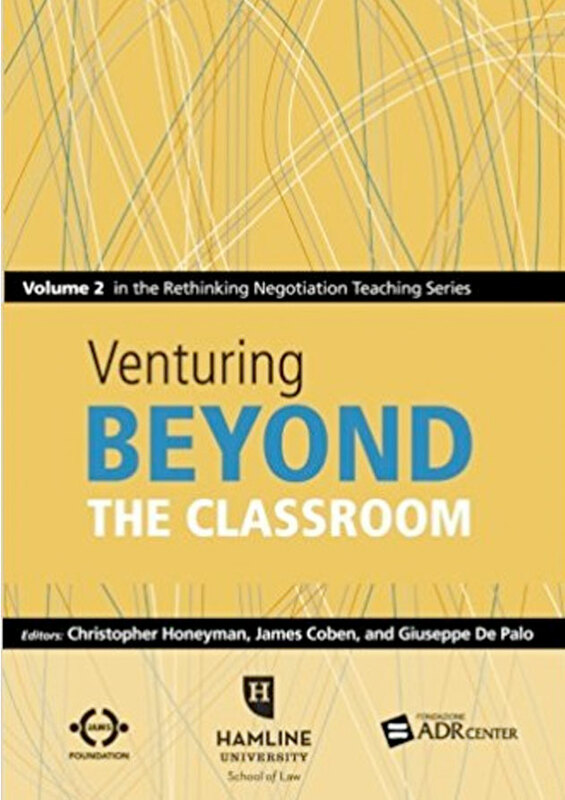 The resulting rich collection of scholarship is gathered in our current title – VENTURING BEYOND THE CLASSROOM. In May 2008, more than 50 of the world’s leading negotiation scholars and trainers gathered in Rome, Italy to embark on a multi-year effort to develop “second generation” global negotiation education. The participants’ post-conference writings – the 22 chapters contained in RETHINKING NEGOTIATION TEACHING -critically examine what is currently taught in executive style negotiation courses and how we teach it, with special emphasis on how best to “translate” teaching methodology to succeed with diverse, global audiences. 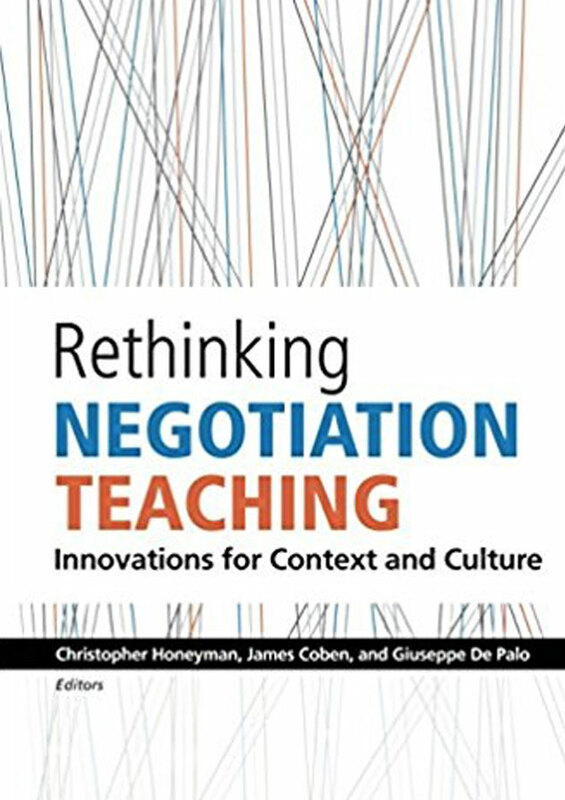 Collectively, the chapters provide a blueprint for designing courses to take account of the most recent discoveries in the growing, multi-disciplinary science of negotiation and confronting the challenges of teaching negotiation in cross-cultural settings.